60 sqm studio is brand new, tastefully decorated and has wonderful water views from private deck and courtyard with BBQ and outdoor furniture. 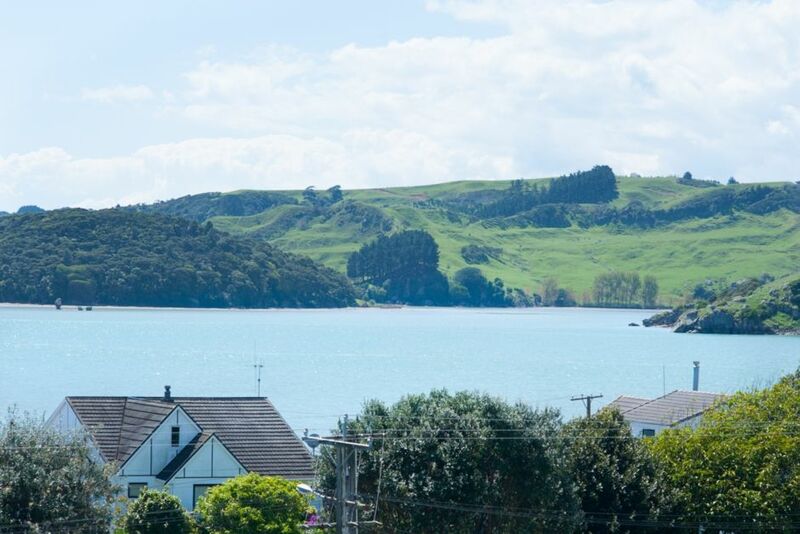 It is a 10 minute walk to the center of Raglan where there are a range of restaurants, bars and shops featuring creative Raglan produced products and art. It is a 2 min walk to the Raglan Wharf that features Tony Sly Pottery, Soul Shoes, Raglan Fish and Chips and the Wharf Kitchen and Bar. A great swimming beach is also a 2min walk. It is a 10 min drive to the famous Raglan surfing breaks and kite surfing at the harbor entrance. There is a wide range of adventure activities on the harbor in addition to catered harbor cruises and fishing trips. Raglan has a 18 hole golf course and mini golf for the less adventurous. The climb to the summit of Mt Karioi is worth the effort as is a drive to Ruapuke to walk along the most amazing stretch of beach. Fell in love with the physical beauty of Raglan, it's diverse and accepting community and the ability to have a positive impact on the environment. Apartment is centrally located and an easy walking distance to all amenities. Plates, bowls, coffee mugs, full range of glasses and cutlery. David is a warm and welcoming host. Small, clean and tidy place to stay. Close to wharf area and not too far from town. Friendly host and small, clean and tidy premises. The supply of 2x beach towels was a pleasant surprise, and although we travelled by car and had brought our own - I thought it would be a pleasant surprise for anyway trying to travel light. Enjoyed Raglan and surrounding areas - Bridal Veil Falls a "must see" - and watching the surfers was also very pleasant. No curtains on some windows and doors ( felt uneasy) bedding was damp and found cockroaches within minutes. We were not allowed to have our guests come visit that had traveled to visit. We were watched when we came in and out. So we didnt go back till late both nights, (being only females staying we felt very nervous) No kitchen for cooking only a little bbq which was also not clean. But I loved Raglan and the locals where very nice and helpful with finding somewhere to stay during the day. Sorry but this was my worst traveling experience in my life. And i have never left a bad review before. Clearly Mandy and I have different views, my apartment caters for couples, 2 people, Mandy hired the apartment during Sound Splash weekend and sought to have multiple people use the apartment, we disagreed over this. Suggest u look at all of the other positive reviews. Great break for us wish it was longer. Great location in Raglan. The unit is very clean and tidy. It has been well setup with all that you need and more. Great host giving us all the info we needed. We would love to go back and stay. having given great attention to detail - linen cushions, Tony Sly pottery and Raglan coffee - a perfect getaway. Thank you Dave - we look forward to returning soon. The accommodation was a great space; very relaxing vibe. Being coffee addicts we very much appreciated the plunger and local coffee provided. Dave has been thoughtful about providing handy amenities also - was great to have milk supplied and shampoo/conditioner/body wash available in the bathroom. The location was fantastic! A couple minutes walk away was The Wharf Kitchen and Bar and great fish and chips on the wharf. Walking to the main street took just 10mins but easy to drive if needed.